Have you ever wondered how Chinese restaurants get their chicken so moist and tender? I used to think they had added MSG or some secret tenderizer that made the chicken taste great but was probably horrible for you. I had all but given up on figuring it out, relegating myself to Chinese takeout when I craved that “velvety” goodness when I came across an article about a cooking process actually called velveting. Used not only for chicken, but also for beef and even pork, velveting is the simple process of marinating the meat in a “batter” of egg whites and corn starch then frying or poaching to set the coating. In restaurants they usually fry the meat quickly in plenty of oil but having tried both I actually prefer poaching. I think the protein comes out more moist and tender when cooked in water and using a little less oil certainly never hurts. Below is the recipe I prepared most recently but the beauty of a stir fry is the unlimited number of combinations of ingredients you can use. This one would be good with broccoli, snow peas, and maybe even a few cashews in place of the chive blossoms and mushrooms…use your imagination and see what new dish you can dream up. Just remember to cook your vegetables starting with the ones that take longest to cook and finishing with the most delicate. Slice the chicken breast into thin, even slices 1/8 to 1/4 inch thick. In a bowl large enough to hold all of the chicken, combine the 5 remaining ingredients and whisk to thoroughly blend. Stir in the chicken slices and toss to coat well. Cover and set in the refrigerator for at least 30 minutes. In a wok over high heat bring 8 cups of water to a very light boil. Reduce the heat to medium and poach the chicken in two batches stirring gently to separate the pieces. Cook until the chicken turns mostly white (about two minutes) then remove to a strainer to drain. 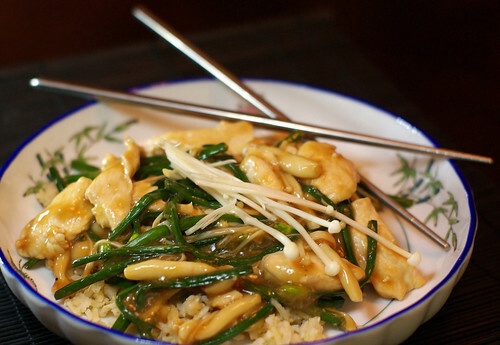 Your chicken is now velveted and ready to use in your favorite stir fry! In a small bowl mix the chicken broth, wine, tamari, hoisin, and corn starch until well blended. Set this aside for later. Heat the wok over high heat and add the oils. Stirring rapidly, add the garlic and ginger and cook about 30 seconds continuing to stir. Stir in the white birch mushrooms and cook one minute before adding the chive blossoms, cook two minutes more while stirring…try to keep the ingredients spread out rather than all crowded in the middle of the wok. Stir in the chicken then pour in the sauce mixture tossing all to combine. Continue cooking only until the sauce has come to a boil and has begun to thicken. With the wok off of the heat gently stir in most of the enokitaki mushrooms reserving some for garnish. Serve over cooked rice and enjoy! This entry was posted in Entree, Poultry and tagged birch, blossom, Chicken, chive, enoki, enokitake, fry, Garlic, ginger, mushrooms, stir, tamari, velveted, velveting, white. Bookmark the permalink.